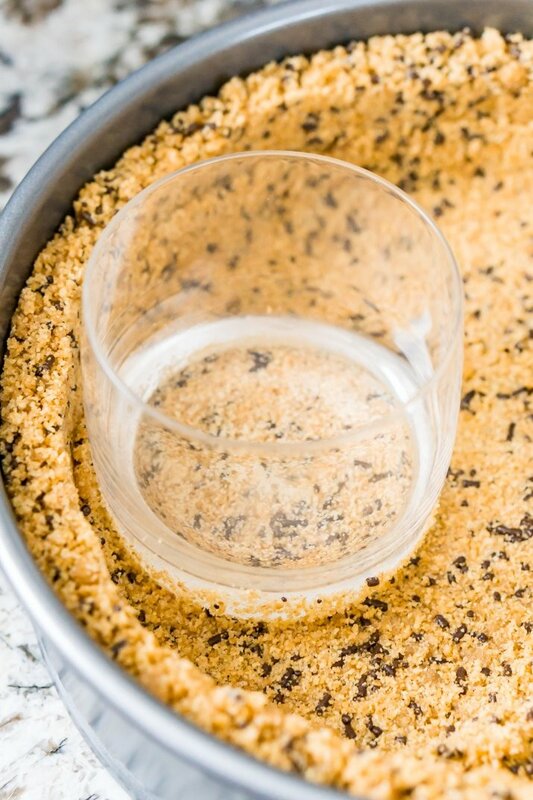 This is the Best Graham Cracker Crust Recipe for all of your desserts both baked and no-bake! This crust is made with graham crackers, butter, sugar, and an ingredient that makes it better than all the rest! Deep dish and standard measurements included! I’m pretty sure half the reason my husband married me was that I make a mean graham cracker crust. And I’m totally okay with that because how could I really compete with a deliciously sweet and buttery pie crust! I mean the man is pretty committed to his peanut butter and chocolate cream pies and this graham cracker crust is the perfect vessel to serve them up in! 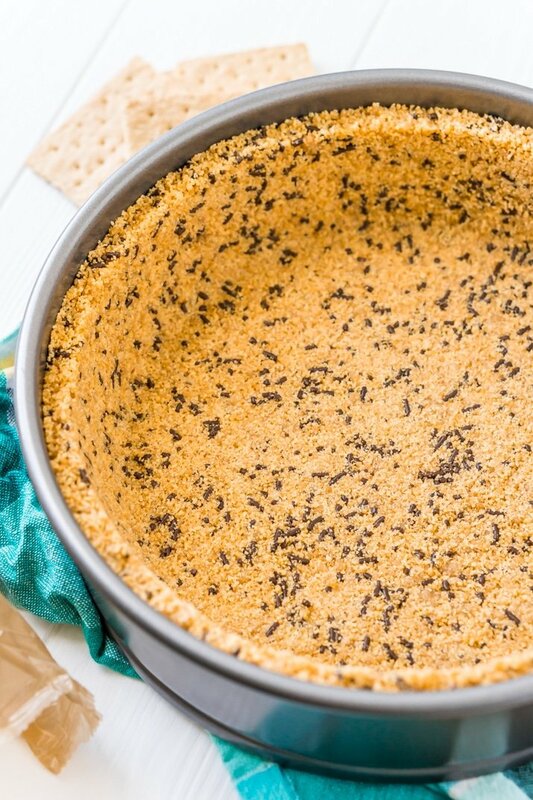 This recipe can be adjusted for both standard and deep dish pies made in either a pie dish or a springform pan, you can also swap out the honey graham crackers for chocolate or even cinnamon! This crust is also a fantastic base for cheesecakes and bars too! It’s so easy and so versatile! While this is a really easy recipe to make, it’s important to follow all of the steps exactly to ensure the perfect pie crust! 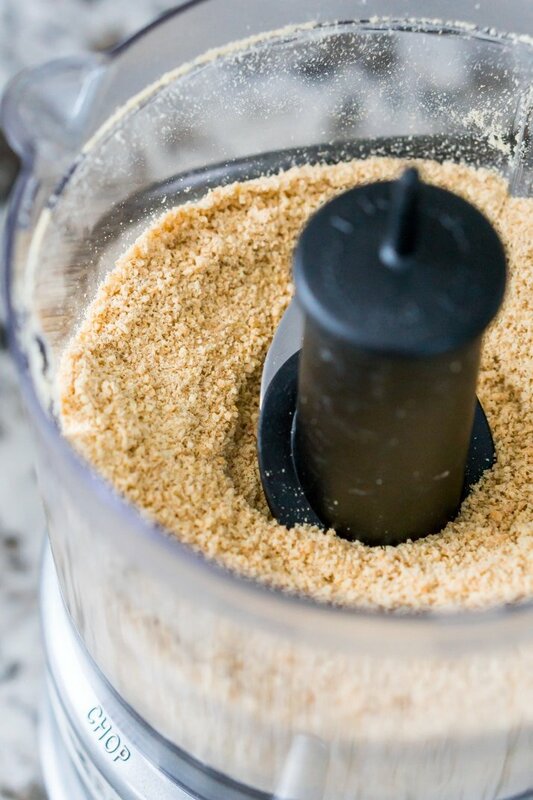 Start by adding your graham crackers into a food processor to pulse until fine crumbs form. If you don’t have a food processor, you can add the crackers to a large Ziploc bag and use a rolling pin to crush them. Alternately, you can now find graham crackers crumbs in the baking aisle at most grocery stores and a box of them costs about the same as a box of graham crackers. If graham crackers are unavailable where you live but you still want to create a similar type of crust, you can use any sweet cracker you’d like – Biscoff cookies bake a great alternative! Just refer to the cup measurements in the recipe notes. Next, add the crumbs to a large bowl and create a well, add the sugars and melted butter to the well. 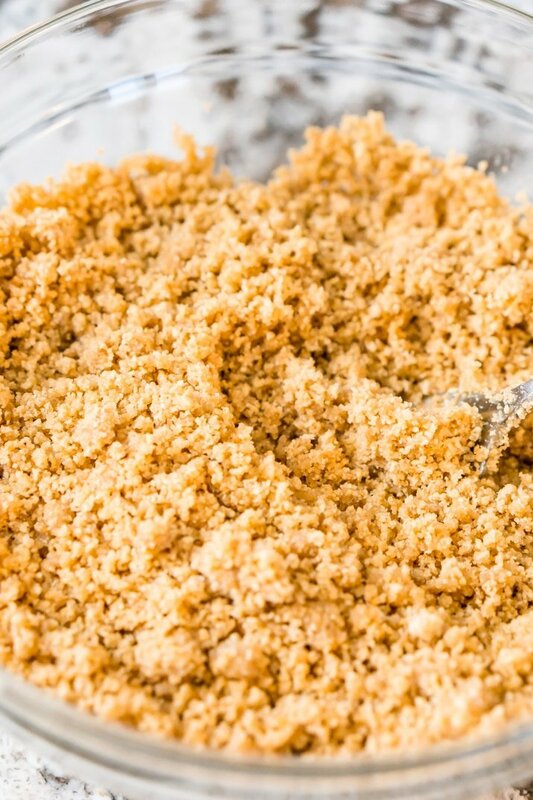 I prefer using both brown and granulated sugar in my graham cracker crusts because it yields such a great flavor. However, you can use all granulated or all brown sugar depending on your tastes. The sugars and butter will work as your binding agents for the crust so it’s very important that you don’t skip them! Then use a fork to combine the ingredients so everything is evenly mixed together. Now it’s time for the best part, the SPRINKLES! 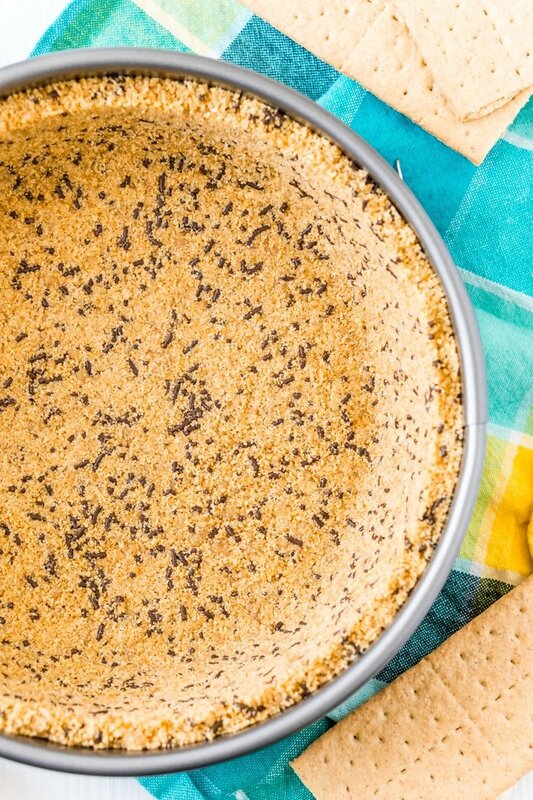 I love adding sprinkles to my graham cracker crust because not only does it lead to a much more fun presentation, especially in deep dish crusts, but it also adds a little extra sweetness! Once you’ve mixed in the sprinkles, pour the crumbs into the pan. I don’t normally spray my pan with cooking spray before adding the crumbs but you can if you’re concerned with the crust sticking. Use a cup to press the crumbs into the pan so that they are packed tightly together to create a strong crust. Once you’ve packed the crust you need to either bake it or chill it depending on the type of pie you’re making. For a no-bake pie, you’ll want to chill the crust in the fridge for at least 1 hour to let the butter fully cool and seal the crumbs together. For a warm pie, you’ll want to bake the pie before adding any filling. You can bake the crust for 10 to 12 minutes at 350 degrees F and then let it cool to room temperature before adding any filling. 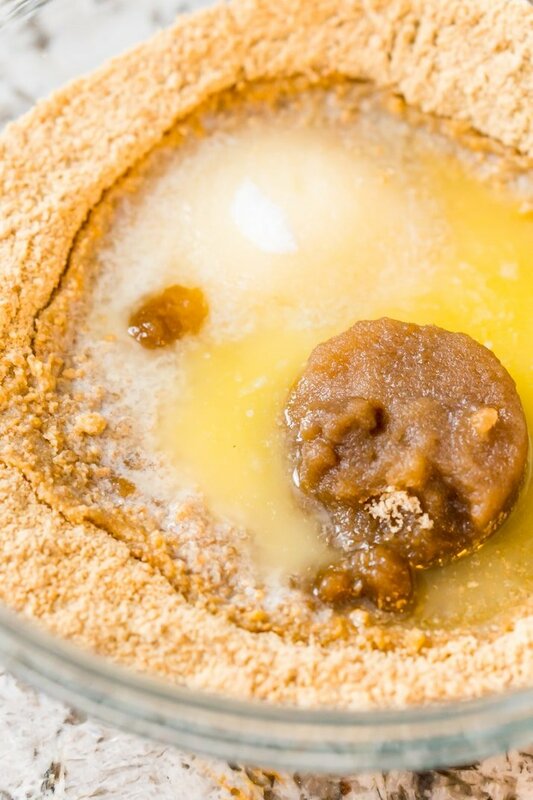 This Homemade Graham Cracker Crust will leave everyone who enjoys it begging for more. It’s sweet, buttery, and the addition of sprinkles makes it a really fun recipe and even a bit of a showstopper! It’s WAY better than using a storebought crust! What Can I Make With A Graham Cracker Crust? Well, the possibilities are endless, you can make all kinds of pies that are both warm and no-bake! You can also make cheesecakes or use this recipe in a 9×13-inch pan to make slab pies, cheesecake squares, or other bars. I hope you all love this recipe as much as my family does! Here are a few recipes to make with it! Pin this Pie Crust Recipe for Later! 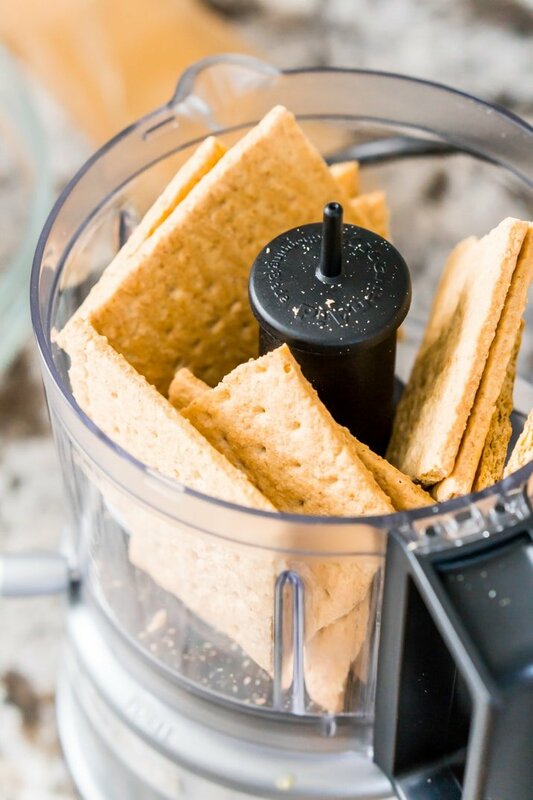 Add graham crackers to a food processor and pulse into a fine crumb. You can also put the graham crackers in a large bag and use a rolling pin to crush them. Add them to a large bowl and make a well. Add the sugars and the melted butter and use a fork to mix everything together until evenly combined. Stir in the sprinkles and then pour the crumb mixture into your pan. Use a cup to press the crumbs into the bottom and sides of the pan, make sure to create an even coverage and press the crumbs firmly with the cup. Preheat the oven to 350 degrees F, once the oven has preheated, bake for 10 to 12 minutes, remove from oven and allow to cool completely. Place the crust in the fridge for at least one hour before adding fillings. 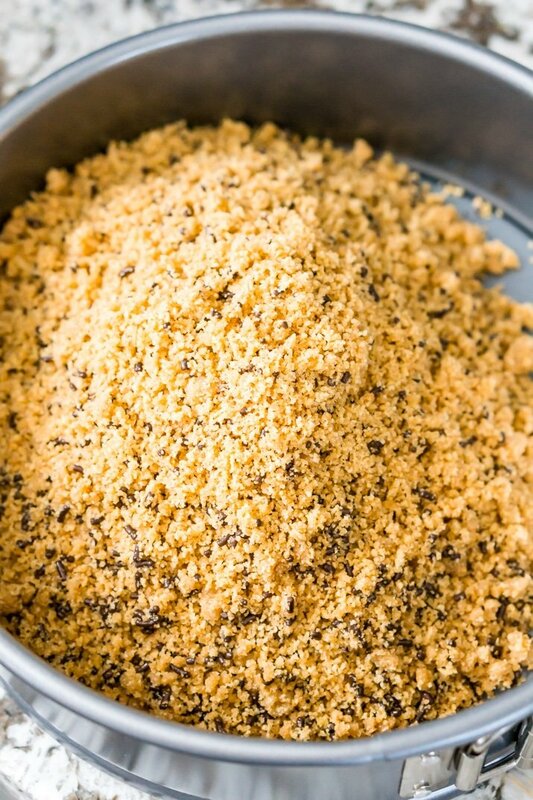 If you are starting with crumbs instead of graham crackers, the deep dish recipe will require 3 cups of crumbs and the standard will require 1 1/2 cups of crumbs. The nutrition estimates are for the deep dish pie. The standard pie should be half the counts. 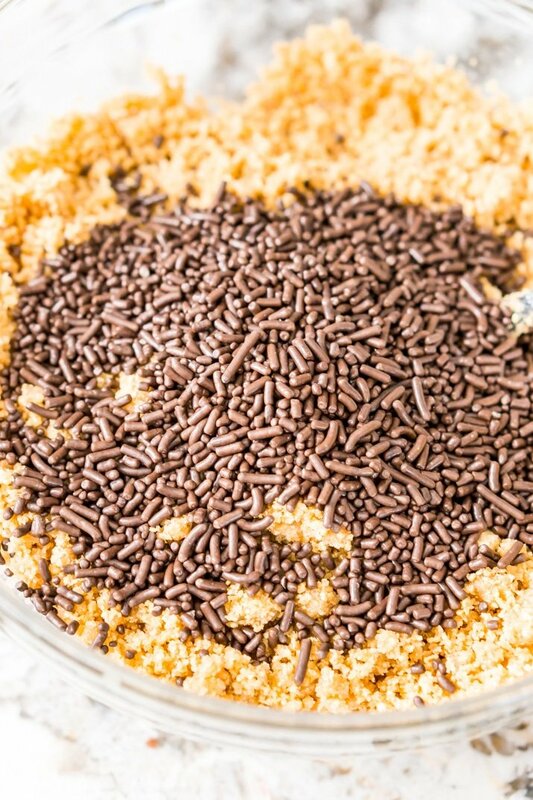 I have NEVER seen sprinkles in a crust – what a fun twist! I’m thinking of making a smores pie with this, YUM! This is such a great, helpful tutorial! And I loveeee adding sprinkles to graham cracker crusts- so fun!